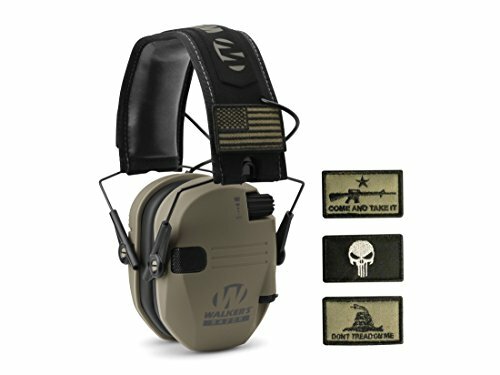 The Walker's Razor Patriot Electronic Earmuffs with Patch Kit feature a Noise Reduction Rating (NRR) of 23 dB, and utilized sound activated compression (SAC) of 0.02 seconds. SAC is a special electronic circuitry that will compress gun shots and other loud noises down to a safe level, without completely shutting the noise off. This allows you to hear range commands or communicate with your hunting partners, even when shots are being fired around you. The Walker's Razor Patriot with Patch Kit also features four individual patches with unique designs that attach to your Razor Patriot Earmuffs with velcro. Your hearing cannot be replaced, so make sure you pick up a set of Walker's Razor Patriot Electronic Earmuffs for your next trip to the woods or range. Includes 2 AAA batteries.